Here's another chance to play geographical detective! This natural-color image from the Multi-angle Imaging SpectroRadiometer (MISR) was captured by the instrument's nadir camera on May 31, 2002, and covers an area of 244 kilometers x 249 kilometers. NOTE: To make identification of this scene more difficult, the image has been rotated such that north is not necessarily at the top. Use any reference materials you like to answer the following four questions about some distinctive features within the scene. 1. The location of a city is indicated by the pale gray-colored pixels in the upper left. Three of the following four statements about this city are true. Which statement is false? (A) No city with a larger population is located within 4 degrees latitude. (B) The city was established about 300 years ago. (C) There are hundreds of bridges within the metropolitan area, of which only one is a drawbridge. (D) A linear feature connecting the island to the right of the city with the mainland supports automotive but not rail traffic. 2. 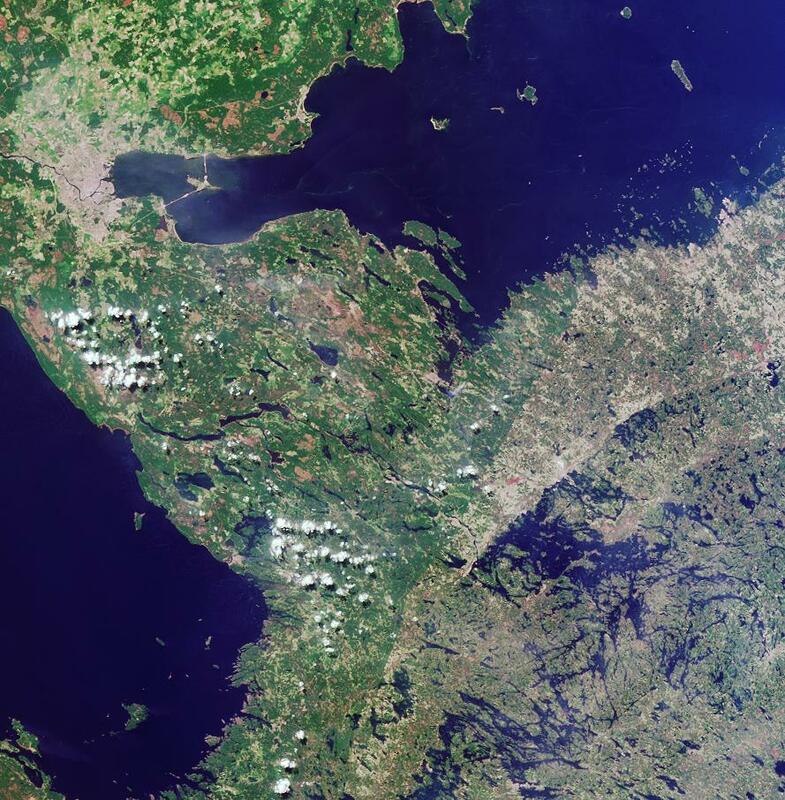 A large blue water body extends along the top portion of the image. Three of these four statements about it are true. Which statement is false? (A) The shores provide an important habitat for at least one type of seal. 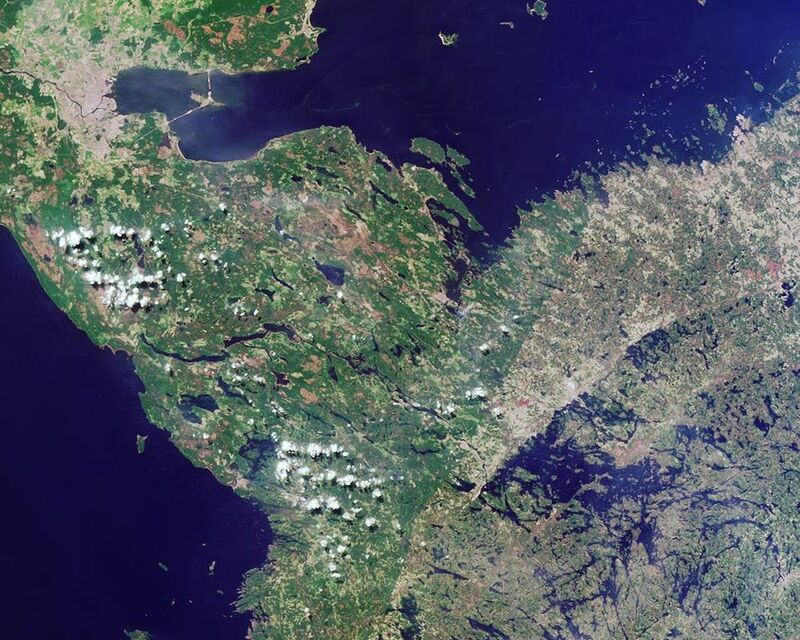 (B) Dreissena polymorpha, an invasive pest species, has been found in these waters. (C) These waters are more salty than most other seas. (D) Forest products account for at least half of all cargo leaving one of the major ports along the shoreline. 3. 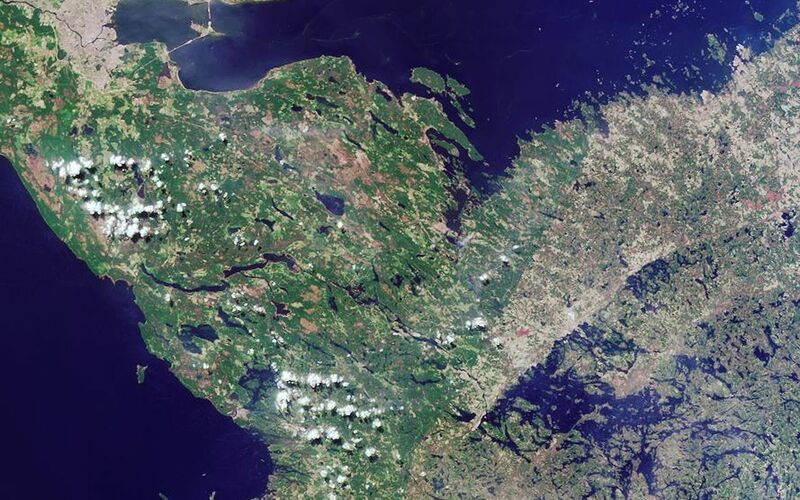 Another large body of water stretches along the left-hand portion of the image. Three of these statements about this water body are true. Which statement is false? (A) Its maximum depth is less than 300 meters. (B) There is an active monastery on one of its islands. (C) It is the main source of freshwater for the region and is currently threatened by pollution. (D) Its basin is of tectonic origin and was formed through movements of the Earth's crust. 4. 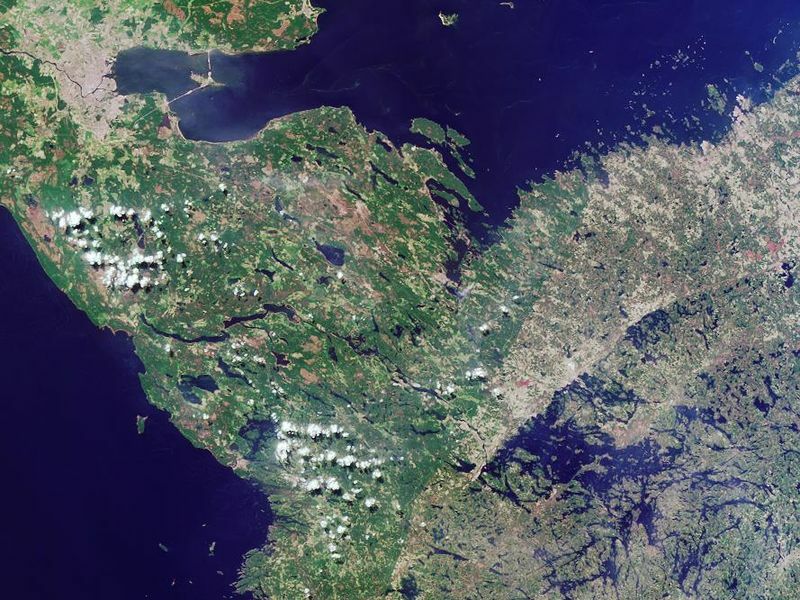 Extending from the bottom center of the image to the water's edge in the upper right quadrant is a curvilinear boundary separating darker shades of green on the left from lighter hues of green and brown on the right. Three of the following four statements about this feature are true. Which one is false? (A) It coincides with a political border. (B) It is associated with an escarpment more than 500 meters in elevation. (C) It demarcates areas characterized by historically different logging practices. (D) It is traversed by a river in which salmon and trout migration has been affected by the construction of a hydroelectric plant. NOTE: This quiz will run for two weeks due to the holiday season. Answers will be posted on Thursday, January 2, 2003. E-mail your answers, name (initials are acceptable if you prefer), and your hometown by Tuesday, December 31, 2002, to suggestions@mail-misr.jpl.nasa.gov. A new "Where on Earth...?" mystery appears as the MISR "image of the week" approximately once every two months. A new image of the week is released every Wednesday at noon Pacific time on the MISR home page, http://www-misr.jpl.nasa.gov. The image also appears on the Earth Observatory, http://Earthobservatory.nasa.gov/, and on the Atmospheric Sciences Data Center home page, http://eosweb.larc.nasa.gov/, though usually with a several-hour delay.